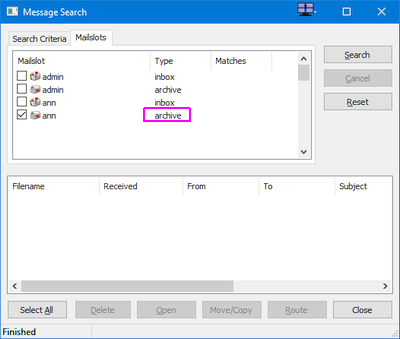 Archiving removes a message from the live User mailbox and places it in a matching Archive-mailbox. Messages moved to the archive are no longer displayed in the user's regular email account. This allows IMAP email clients to work at their optimum speed without having to constantly monitor old messages. Archived messages, however, are no longer browsable in IMAP clients - they should be considered as in deep-storage. Users are not able to modify messages in the archive, and as such they provide compliance level archiving for legal mail retention requirements. Archiving provides a searchable store of messages from which one can recover an 'old' message. 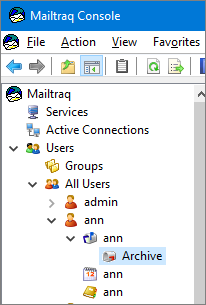 This section explains how to configure Archiving in Mailtraq - how to set the mailbox controls and use the System Archive - and how to recover messages from the Archive. Many governments define mail retention requirements for corporations, making it mandatory for you to have a history of all e-mail for a required period. Conversely, it is often not in the corporation's best interests to maintain mail indefinitely. For both of these reasons setting a specific mail retention policy is a safe way to control what happens to your mail in the long term. The primary controls for Archiving are found in the Archive-tab of the individual Users' mailbox. Mailboxes do not archive by default - all messages are retained. The Administrator can either set individual archiving rules, or configure a system wide Default at the System Mail Archive control. AFX has been the default option since March 2007, and is the recommended choice for nearly all users. It replaced a central store of messages with individual archives for each mailbox. When you are using AFX messages are moved from the mailbox to the matching archive in the database. Note that only mailslots which enable an archiving policy will actually archive messages to the system archive. A simple means for getting all messages regardless of destination is to create an inbound copy mailslot and use the Forward a copy of all incoming mail to feature in Options | Incoming Mail... | Options. Since all mail (both received from outside the organization and sent from within the organization) is at some point incoming to Mailtraq, this option will effectively copy all mail that is processed. 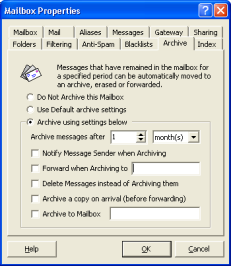 Then simply configure the archive settings for that mailslot to move messages to the system archive after a short period. Read about creating simple 'Copy' Records here. The Archive system also relieves the burden on the main mailbox in IMAP/Webmail installations by moving messages out of contention so they don't have to be loaded. Messages are still accessible to users, but are not displayed every time the email client 'refreshes'. Read about Accessing archived messages. Archiving can be processor intensive, particularly if you impose expiry to archive on a mailbox with a large volume of mail. Mailtraq provides Database Maintenance controls to allow you to manage this process. It is essential that you a configure suitable Database Maintenance schedule to make sure the system works efficiently. Automated responses to mail messages can be regarded as a security risk in certain circumstances, so this option should not normally be selected. Check this option to have the message sent to a specified e-mail address when the archiving takes place. This address can be a regular Internet address or the name of a local mailslot. A copy is also Archived unless the following control is also enabled. This can be used in conjunction with the 'Archive a copy on arrival' option. If this option is checked then messages will be deleted rather than being archived and will not appear in the system archive. What actually happens during Archiving? Mail that is archived is copied from the mail\inbox\mailslot.afx file to the matching mail\archive\mailslot.afx file. The messages are then marked for deletion from the Inbox mailslot.afx file. Deletion takes place during the Maintenance Period set at Options | Server | Database and it is important that enough time is allowed for maintenance to take place. Administrators can recover messages from a User from the Console by opening their Archive mailbox. Messages may then be selected and then copied to the Primary mailbox. Tools | Search for Message, where the mail archive can be searched. Messages can be moved using the right-click menu options. Messages are not available for recovery from the Archive until they have been Indexed. Users of EWA webmail can browse their Archive. [x] " Allow users to access their mailslot archives "
is checked in the webmail 'admin' section, Search Message Contents-tab. Users can then use the "Copy" command, say to their Inbox or a folder created for this purpose, to get a copy of a message out of an archive but they cannot modify the archive content. 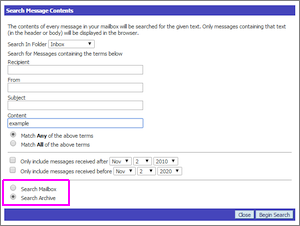 Users of Standard webmail can use the message 'Search' to search their archive, but they cannot browse for messages.